If you were wondering if there is some good information on the Koh Tao weather situation, then look no further. Whether you need to know if it is the start of Koh Tao Season or the end of Koh Tao monsoon season, we have a detailed breakdown of the weather here on Koh Tao for the whole year round. If you are planning a trip several months in advance, please refer to our season guide below, which breaks down the weather on Koh Tao on a monthly basis. Nothing ruins a trip more than unexpected weather conditions. 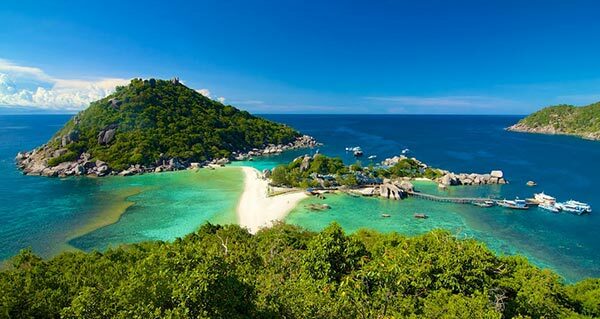 Koh Tao has a tropical climate and is hot and sunny all year round with occasional heavy rainfall during monsoon season. We are a tiny island in the middle of the Gulf of Thailand and it i can therefore be difficult to predict the weather accurately at times. We get the occasional rainfall in hot season and really sunny days in the middle of monsoon. We work as closely as we can with nature. When is the best time to dive Koh Tao is hard to say. We are open and go diving all year round unless it is unsafe for us to take our dive boat out. Weather can affect underwater visibility and some months generally provide better visibility. Visibility is hard to predict as it is also dependent on tidal cycles and coral spawn around full moon. Sometimes you might prefer a quieter island, so there are other factors when it comes to deciding the best time to visit Koh Tao. We generally experience three seasons. A hot and dry season, a hot and windy season and a wet season. Throughout these seasons our temperatures remain fairly constant, at an average between 25 to 36 degrees Celsius. During hot and dry season the temperature does not tend to drop much during the night. In hot and windy season we experience a slight drop during the night and in rainy season we sometimes see a drop of several degrees at night. We have blue skies every day and it is nice, hot and sunny. During this season rainfall is at its minimum, so we encourage you to be responsible in using water on the island. Air temperature can reach as high as 36 degrees Celsius in high humidity and rarely drops below 28 degrees Celsius. The water temperature can reach 30 degrees or even more. Our hottest time is during March to May. If you love it baking hot, then this is the best time to visit Koh Tao. In March and April is generally one of the best times to visit Koh Tao as it is one of our Whale Shark seasons. Because temperature and humidity can get extremely high, we recommend staying on Sairee Beach with a cool ocean breeze and a fan. Sairee Cottage Resort also offers air-conditioned accommodation for those that struggle a little more in the heat. After the hot season some much needed wind comes in to cool our little island down. We refer to this as our windy season. The temperature is still hot with a high of around 34 degrees. The ocean is around 29 degrees and cools down toward the end of windy season. During this time we may have to adjust our dive site schedule to suit our needs as big waves are something we like to avoid when scuba diving. Between July, August and September, visibility can hit 30 meters and more, so this is a great time to dive Koh Tao. From June to September our island tends to be a little busier than usual, so we recommend booking accommodation and diving courses in advance. This is our rainy season. Even if this is our wet season, it is rare that rainfall persists for an entire day. Generally we get thunderstorms in the late afternoon, which are often a welcome cool change. There is plenty of sunshine and temperatures are a little more enjoyable. During monsoon season which is usually around November you can expect the Koh Tao weather to change a little. The temperature can drop to around 28 degrees Celsius and we often get two hours of heavy rain and the rest of the day can be overcast. During October and November we can get several days of continuous rainfall. It is not all bad during November as this is also a great time to dive with Whale Sharks and the visibility is still up to about 12 meters. Many dive centres shut for several weeks at a time during these months. Sairee Cottage Diving is open all year round and we operate daily fun dive trips and start any level courses during this season. The rest of rainy season has light rain here and there. Temperature ranges from 25-30 degrees and the water temperature can drop as low as 26 degrees. During heavy rain visibility may on occasion be less clear than during our hotter seasons. We experience seasonal tides on Koh Tao and during wet season we see higher levels, which can mean less access to sandy beaches and often bigger waves. We hope this guide was helpful in planning your trip to our little tropical island paradise. Just remember that the Koh Tao weather can be hard to predict accurately. This however does not mean we don’t have fun! In general the weather is extremely nice, hot and sunny tropical with the occasional rainfall throughout the year. During wet season you can expect more rain and slightly cooler temperatures.